Having backups of your WordPress site is extremely important for security concern. I think it’s the best defensive measure you can take easily for your site; if somehow your website gets hacked and you lost all the data. Then, with backup, you can make your site live again in just a few minutes. In this article, I’m going to show you how to create an automatic WordPress backup for free so that you can forget about losing the valuable data of your website. Why You Need a Backup Solution for Your WordPress Site? According to research, data loss and downtime cost $1.7 trillion each year to the global economy. Can you imagine that? Your website can get hacked and hackers may destroy all of your data. Your hosting provider can lose your data or you can forget to renew your hosting before expiration. Your website hosting provider reserves the right to terminate your account and delete all your data. Besides that, there are many other scenarios where you could end up losing your website and all the valuable data created over the years. This is why the best way to easily protect yourself against these threats is to regularly backup your WordPress site. In addition to that, you can also limit login attempts and add a security firewall for better protection. Having said that, let’s dive into the automated backup creation for your WordPress site regularly. WordPress hasn’t its default backup solution. However, there are several great plugins which allow you to automatically backup and restore your WordPress site. UpdarftPlus is one of the best backup plugins for WordPress sites, which allows you to setup automatic backup schedules. Besides that, it’ll also help you easily restore your WordPress site in case something bad happens. 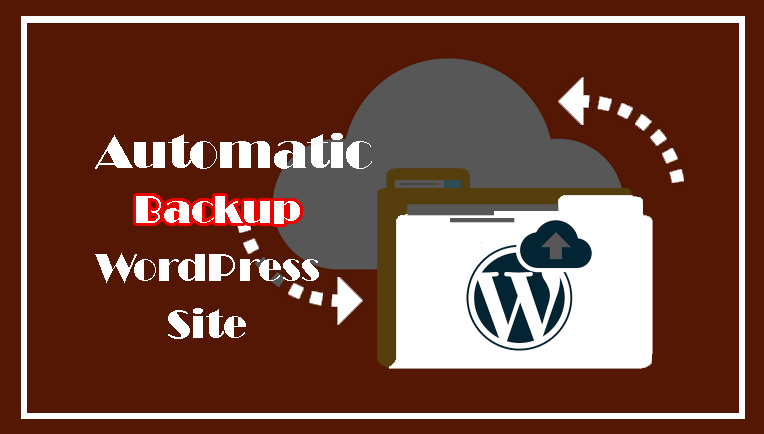 So, let’s create an automatic backup system for your WordPress site. First of all, you need to install and activate the UpdraftPlus plugin on your site. For this, go to Plugin » Add New. Now, search for the plugin on the search bar, then install and activate. Once the plugin is activated, you’ll find the ‘UpdraftPlus Backups’ button under settings. So, click on it to open the plugin configuration settings page. This is where you can set up an automatic backup schedule and a remote location to store your backups. For automatic backup, you first need to choose a backup schedule for your files. Where the files include your WordPress site’s themes, plugins, images and other uploads. Next, you need to select a backup schedule for your WordPress site’s database. All your posts and pages, comments, website settings, are stored in the database. Of course, the backup schedule should be based on how often you add new content to your website. As an example, if you add/publish three blog posts each week, then you can simply select a fortnightly backup of files and weekly backup of the database. After that, you need to choose the location to store your all backup files. By default, UpdraftPlus stores the backups to the same location as your website which isn’t a good idea at all. Because losing your website means you will also lose the access to your backup files. That’s why you should choose a remote cloud storage service to store your backups. As you can see, UpdraftPlus allows you to save your backups to several cloud storage services including Dropbox, Google Drive, Microsoft OneDrive, and some others. In addition to that, you can also send your backups to an email address. So, simply click on a remote storage to select it. Then, you will see setup instructions. Here, I’ll be showing you how to use Dropbox as the remote backup storage location with UpdraftPlus. So, click on Dropbox to select it, and then scroll down to the bottom of the page and click on the save changes button. After getting the setting saved, now you need to give UpdraftPlus access to your Dropbox account. For This, scroll down to remote storage setup instructions and click on the link next to ‘Authenticate with Dropbox’ option. It’ll take you to the Dropbox website where you will be asked to sign-in using your Dropbox email and password. Then after login, you will be asked for the permission to allow UpdraftPlus to access your Dropbox account. There is nothing to worry about it, UpdraftPlus will only have permission to access its own folder. So, click the ‘Allow’ button. Now, you’ll be redirected to UpdraftPlus website where you need to click on ‘Complete Setup’ button to finish setup. Once the setup finished, you’ll be taken back to your WordPress site’s UpdraftPlus settings page again. Now, scroll down to the bottom of the page and click on the Save Changes button. That’s it, the automatic backup is on and all the backups will be stored safely in your remote cloud storage. Hope, this article will be helpful to keep regular backup your WordPress site automatically. So that, you can restore your site again if anything bad happens. Anyway, if you’ve already used UpdraftPlus to your WordPress site, please share your experience and tips with us. Here we are all together.